The latest range of features for Adobe XD CC integrate with Dropbox and popular UX tools. Hats off to Adobe, it really does seem to listen to user feedback. Just take a look at the latest batch of updates to its prototyping tool, Adobe XD CC, which are available today. These features, which have been requested for a while, aim to make workflows smoother by integrating popular UX tools. Adobe hopes that this will make designer and developer handoff easier. One of the biggest draws for designers is that Dropbox now supports native XD file previews on mobile, web and desktop. What's more, when users view an XD file saved to Dropbox, a preview of the file automatically displays. This means that designers and stakeholders can sort through their assets via Dropbox more quickly than before. “Our goal is to unleash creative energy through an expanding partner ecosystem, and connect design tools like Adobe XD with core Dropbox mobile, web and desktop products," said Daniel Wagner, engineering lead, Dropbox Previews. 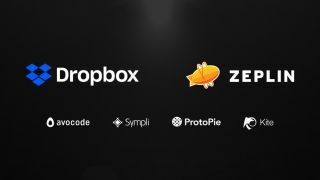 As well as incorporating Dropbox, creatives can now quickly export their designs from Adobe XD into third-party tools like Zeplin, Avocode and Sympli. These highly requested workstreams are already part of designers’ existing processes, but with direct integration with XD they can now handoff the developers without disruption. The latest update also sees XD integrate with ProtoPie and Kite Compositor, letting designers add advanced animation to their XD prototypes. Another significant enhancement to emerge from the latest XD update is that designers now have the ability to zoom in and out of a canvas with thousands of artboards without compromising performance. On top of this, Adobe XD has released five free UI kits in partnership with leading UI/UX designers around the globe. These make it easier than ever to get started with designing apps for different problems. "Adobe XD's human-first design approach and integration with other Creative Cloud tools has made it incredibly easy and seamless to create scalable and cross-platform design systems,” said Michael Wong, designer and founder of Mizko Media & the Designership, which created a gaming console UI kit for Adobe XD.